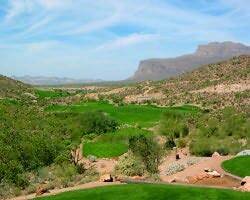 Golf Zoo's Blog: Gold Canyon - What a great Stay and Play! Gold Canyon - What a great Stay and Play! My father came into town last weekend for Father's Day, and we decided to get "outta town" for a guys only golf weekend. Gold Canyon Golf Resort (about 35 minutes east of Scottsdale) was the perfect choice - I chose it for the golf, though I had never actually stayed at the Resort before. I was extremely impressed with the accommodations. Our unit, a "Spa Casita" is basically a hotel room, but a LARGE hotel room. 2 double beds + a sitting area to watch the NBA playoffs made it very comfortable for 2 guys to hang out, and sip a little Makers Mark. The clencher here was the private patio with the PRIVATE JACUZZI right outside your back door. It's the perfect setup. Also, the restaurant (Kokopelli's) was excellent for both breakfast and dinner. We had all you can eat catfish Friday night, and prime rib was the special on Saturday. The prices were great - much less than what you would expect at a resort - great food, great prices, and exceptional service. The breakfast buffet with an omelette station was a great value as well. If you're coming to Scottsdale, but want a resort that's a little more out of the way and secluded, give Gold Canyon Golf Resort a try.